I am a big fan of The Biggest Loser. 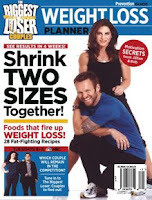 I read the following from Prevention Guide's The Biggest Loser: Couples Weight Loss Planner and thought it was worth sharing. No matter what you've heard, weight loss boils down to two basic factors: calories in and calories out. If you don't eat fewer calories than you burn, you won't lose weight. If you want to continue losing weight, you have to eat fewer calories, exercise more, or both. If you weigh more than 300 lbs., start by eating 2,100 calories a day. If you weigh less than 150 lbs., plan to eat around 1,050 calories a day. On The Biggest Loser diet, you learn to focus on the quality of the calories as much as the quantity. Avoid white flour, sugar, and processed foods, which are high in calories and low in nutrients. Also, be sure to eat a variety of whole, natural foods. When you eat more of the good stuff you'll find you want less of the fatty, greasy, sugary foods that helped you pile on the pounds in the first place. Source: Prevention Guide's The Biggest Loser: Couples Weight Loss Planner, March 2008 © 2008 Rodale Inc.